The Mormon Tabernacle Choir has performed for U. S. presidents of both parties in many settings, including six previous presidential inaugurals. 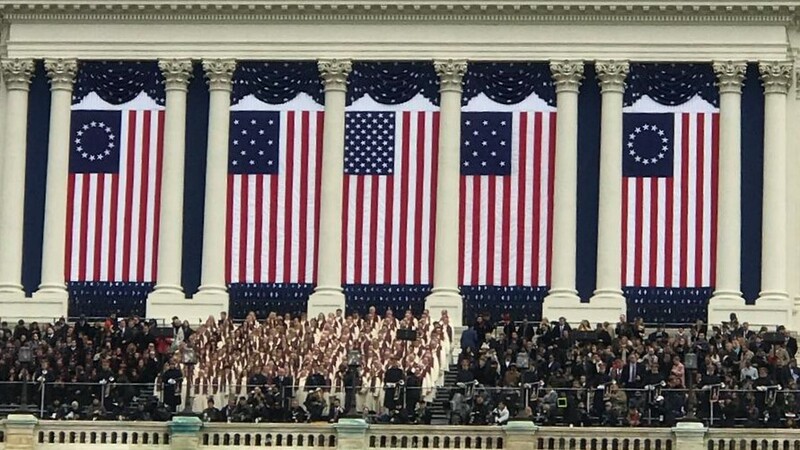 The previous inaugural performances have included swearing-in ceremonies, appearances in the inaugural parade and at the inaugural opening ceremony as well as at a devotional program. The Choir’s participation in these events is not an implied support of party affiliations or politics, but rather a demonstration of its support for freedom, civility and the peaceful transition of power. The 2017 participation in the swearing-in ceremony of the 45th president is the Choir’s seventh inaugural performance. “The Mormon Tabernacle Choir has a great tradition of performing at the inaugurals of U.S. presidents," said Ron Jarrett, president of the Mormon Tabernacle Choir. "Singing the music of America is one of the things we do best. We were honored to be able to serve our country by providing music for the inauguration of our newest president." Because of space limitations on the platform at the U.S. Capitol, the normally 360-voice Choir was limited to having just 215 members perform. Because so many more Choir members volunteered to sing than the number required, Choir leaders used a random selection process to choose those who would travel to Washington DC to perform.